BILD is Milwaukee and Wisconsin’s premier wheelchair ramp provider, offering many different types of wheelchair ramp options including: modular wheelchair ramps, wood ramps, concrete ramps, landscaped wheelchair paths, and portable wheelchair ramps. We provide traditional wood and modular ramp sales, and provide options for rentals of modular wheelchair ramps, lift systems, or portable wheelchair ramps, as well as rent-to-own financing options. Our accessibility consultants teach professionals nationally how to provide safe wheelchair ramp options for wheelchair users. We provide wheelchair ramp options that are low maintenance, functional, and that will meet your needs. We will assist you in the process of determining a wheelchair ramp layout that provides safety and independence. We provide options for your mobility needs with traditional wheelchair ramps that are constructed of wood, or modular (metal) wheelchair ramps with railings that can be used for rentals and temporary needs or for lifetime needs. Modular aluminum wheelchair ramps have the benefit of requiring little to no maintenance, and having flexibility to move or reconfigure the layout or length of the ramp. We can aesthetically integrate the appearance of any wheelchair ramp to your home as well with options such as custom finishes, or powder coating options for metal ramps. Traction features that make the ramp easier and safer to manage for both the wheelchair user and the caregivers, and keeps them safe. Aggressive ramp edging that provides security for the wheelchair user. Supportive railings that provide additional safety and security. Smart design features such as optimally placed upper landing, intermediate landings, individualized slope considerations, and appropriate turning clearances for ease of maneuvering the wheelchair. Many material options for different types of wheelchair ramps: pressure treated lumber, cedar, composite decking, aluminum, or concrete. Threshold transition modifications to ensure that the wheelchair user or caregiver is able to safely and independently manage the ramp. Wheelchair ramp options for homes and businesses who require commercial grade wheelchair ramps. Wheelchair ramp alternatives and counseling in other options including rentals for stair lifts, and wheelchair platform lifts. We stock portable and modular ramps at our Milwaukee office, and can often meet your needs on short notice. Please call us today to learn more about what options may best meet your needs for ramping of the home. The professionals at BILD offer unmatched expertise in the best wheelchair ramp materials, designs, and alternatives to help meet your mobility needs for safety and independence . BILD offers a quick, affordable, and durable solution for ramping your home with modular ramps in aluminum or composite materials. Modular ramp systems are quick to install, reusable, rust resistant, low maintenance, and easily adapted or moved at any time. 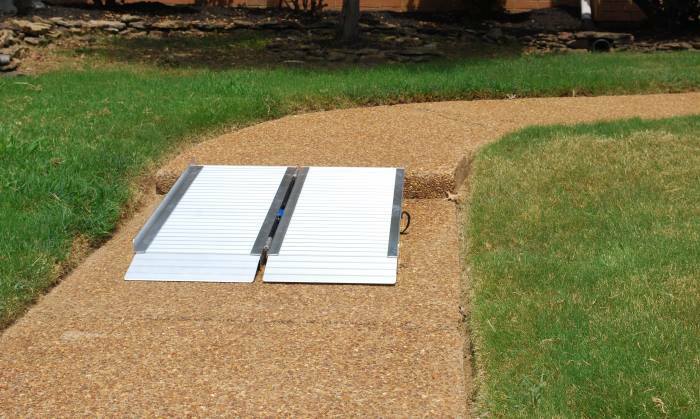 Modular ramps can be installed in the winter and are extremely strong. Unique grated flooring is slip resistant and easier to keep clean and remove snow. Powder coated painting can greatly improve the aesthetics of a modular ramp. Options available for rental or for purchase. Wood ramps can be constructed with pressure treated lumber, cedar, or composite decking. Our expert finish carpenters and craftsmen can construct simple to elegant custom wooden ramps. Our careful consideration of your home entry options and design will help to ensure beauty, functionality, and value for your independence as you access your home. We are specialists in ramp design, and will create a safe layout that meets your needs. Landscaping a threshold-free access to your home is a practical and beautiful solution to your home accessibility needs. BILD can work with you to find a solution that is beautiful, practical, and functional. We can help you with any style, including concrete. BILD offers a full line of portable aluminum ramps and can have them delivered to your doorstep for your convenience. Many options and types of ramps are available for rental or purchase, including bi-fold and tri-fold “suitcase” ramp options which are easier to carry. Threshold ramps can be pre-ordered to height with rubber threshold ramps of different colors, or custom wood threshold ramps can be fabricated to your home’s décor. Wheelchair threshold transition ramps provide more safety, independence, freedom and comfort for access outside of the home, and into the home as well. Often times wheelchair users first realize the challenge of managing thresholds in the home, and we provide simple solutions to manage doorways, entries and interior threshold transitions more easily.